Chang Apana, former Honolulu detective and prototype of the character "Charlie Chan" in the mystery novels of the late Earl Derr Biggers, died in the Queen's hospital at 7:30 p.m. Friday. Mr. Chang was seriously ill for about a month and was admitted to the hospital on December 2. His left leg was amputated Thursday and two members of the Honolulu police department, Capt. En You Kau of the patrol division and Detective Thomas Quinn, gave their blood for transfusions. Officer Roger Whitmarsh also offered his blood and was prepared to undergo a transfusion. Serving longer than anyone else on the local police force, Mr. Chang was one of the most picturesque and best known characters in the city. His achievements reached the attention of Earl Derr Biggers before the novelist visited the islands and some of them were worked into "The House Without a Key." Later, when Mr. Biggers came here for a visit, he and Mr. Chang became friends and the writer created the detective character "Charlie Chan" as a result. Mr. Chang joined the police department when the city and county was incorporated 35 years ago and was one of its most popular members until he was pensioned in May, 1932, after he had been seriously injured in an automobile accident. After that, he was employed as a watchman for the Hawaiian Trust building until his illness. "He was the greatest person I have ever known," was the tribute of Capt. En You Kau when he learned of his friend's death. They had worked together for about 29 years. Other veteran officers tell stories of his feats of daring, especially relating to the early days of Chinese immigration to the islands when there was much opium smuggling. They say he never lost his courage, although knifed and beaten many times. 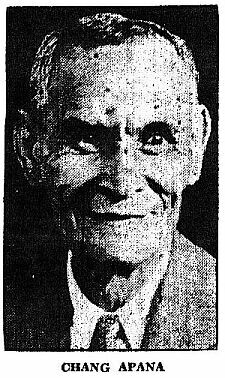 Born at Waipio, Oahu, Mr. Chang was 64 years of age. He is survived by his widow, Mrs. Annie Lee Kwai Apana; eight children, Annie, Rose, Margaret, Cecelia and Alexander, and, by a former marriage, Mrs. Helen Meheula, Victoria Apana and Samuel Apana; 10 grandchildren, and a brother, Chang Kwock. Arrangements for the funeral, which will be at the Nuuanu mortuary, had not been completed this morning.